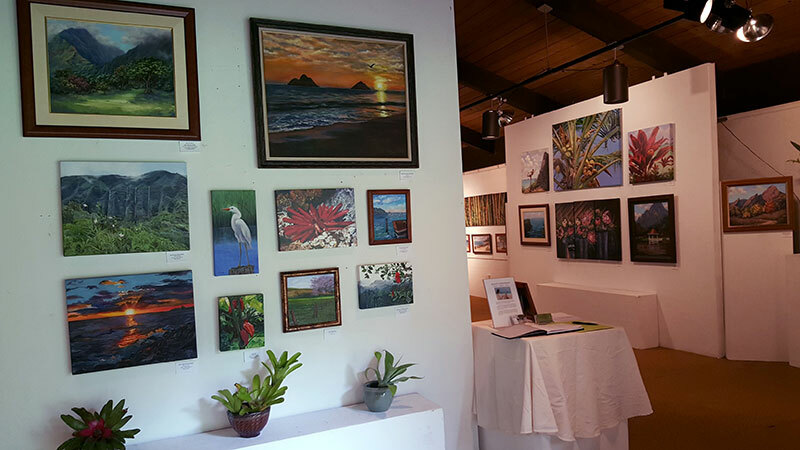 The Paradise Painters Show at Hoomaluhia Botanical Garden Gallery went very well. We had a lot of visitors despite the massive storm systems that passed through our islands, one after the other, leading to muggy heatwaves, impressive flooding and less visitors than normal to the gardens. 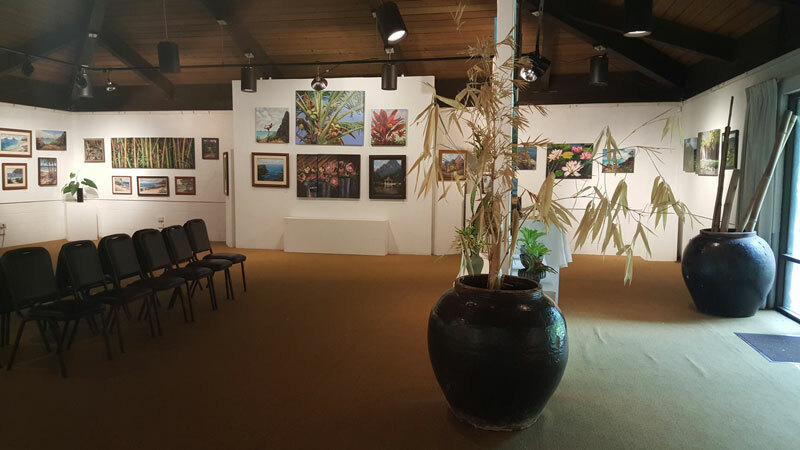 Despite the unusual weather, people from all over the world came to the beautiful garden and its gallery to view our show. Thank you to everyone who braved the elements to visit! This year, I made a special effort to add a few plants and flower arrangements of my own now that I have a garden. I ceased to be a renter last year around this same time when we finally were able to buy a home here in Oahu. Having a yard of my own to plant with the flowers and fruit trees that I love most is a dream come true that has taken many years to achieve. Though I have had other gardens in the places I have lived, this one is the first one where I am sure I will be staying in one place. I can finally plant things and watch them mature all the way! One of the bouquets I created for this year’s show. Not all the arrangements in the photos of the show are mine. 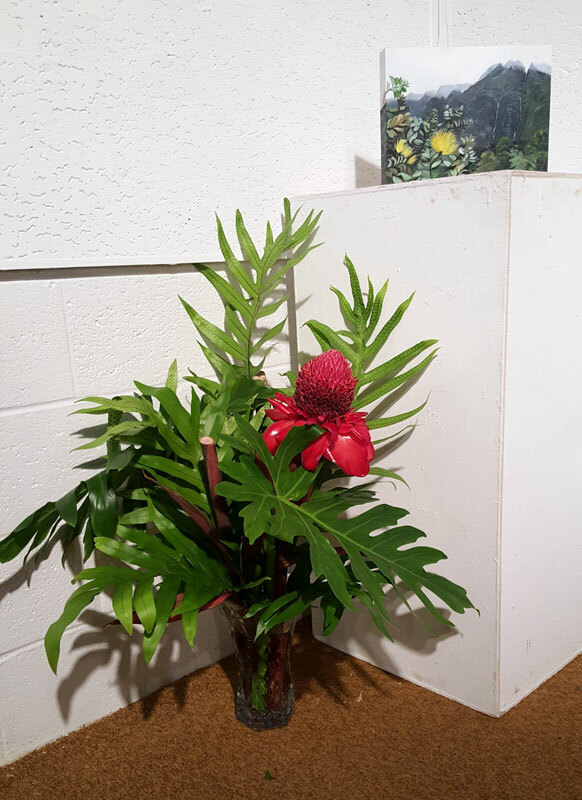 There are talented floral arrangers that allow us to utilize their gorgeous bouquets for our show. I think it really helps brighten the gallery space and add more dimension to the show, especially one that takes place in a garden. My main area in the show. Most of the work is mine, but the two paintings most to the left side are by Kelley Fitzgerald. I love plants as much as I love paint, so it’s becoming a side interest of mine to make floral arrangements from the wonderful flowers that grow in my yard. Most of these are plants I have inherited from the prior owners who had wonderful taste in plants. Perhaps next year I will be able to have increased variety from the plants that I have worked so hard to establish this year.